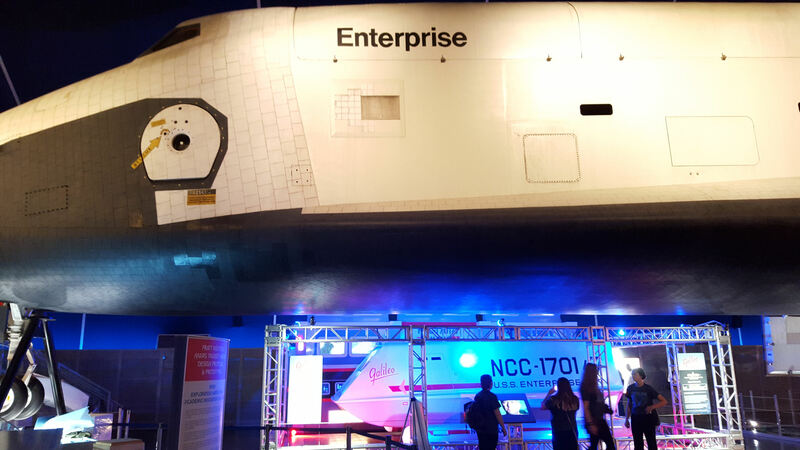 2016 NYC Trip Photos #15: Shuttles in Starshine « Midlife Crisis Crossover! A battleship turned into a museum was a fascinating concept in itself. Their vintage aircraft collection was a value-added bonus. But for our money the greatest exhibit of all aboard the USS Intrepid Sea, Air & Space Museum was a premium exhibit space on the upper deck showcasing the great-granddaddy of the American Space Shuttle program, the one that started it all, the Space Shuttle Enterprise. 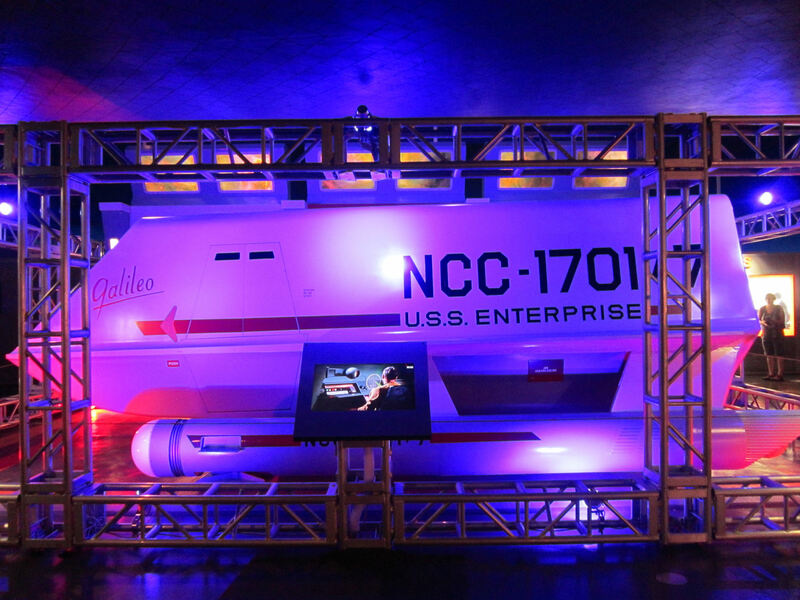 Parked beneath the Enterprise is a second vehicle: one of the shuttles used in filming episodes of the original Star Trek series during its 1966-1969 run. 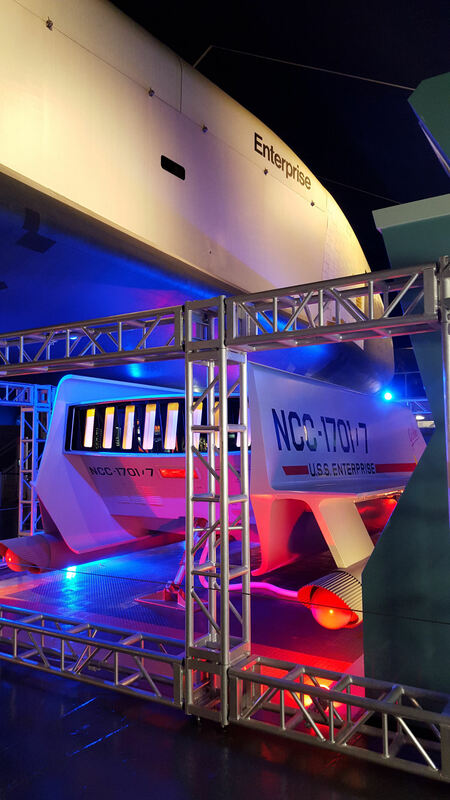 Because someone among their ranks has dual senses of humor and awesomeness, we have the Enterprise shuttle and an Enterprise shuttle, basking together with an aura of simulated starshine for ambiance. Call them the Astrodynamic Duo. The museum had a handful of items supporting to the “space” aspect of the name — not as many as we enjoyed at Kansas’ Cosmosphere (cf. our 2012 road trip), and nowhere near the American space cornucopia that is Kennedy Space Center (cf. our 2007 road trip), but it was a start. Down on the hangar deck, the largest artifact was also the most disappointing. 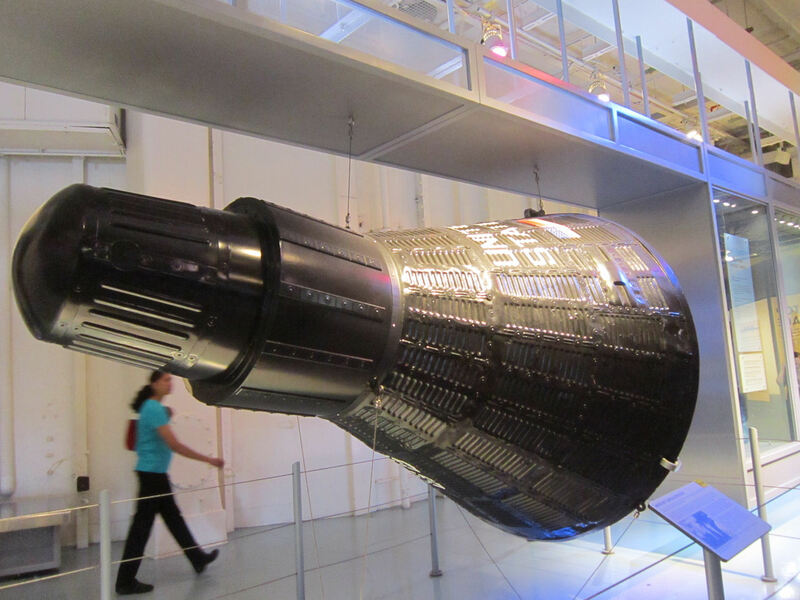 This Mercury space capsule looked cool till we read the placard. Once again we encountered that word most disappointing to a history buff: “replica”. Sigh. Meanwhile on the upper deck: one real Space Shuttle from NASA’s space program alongside one real, fictional shuttle from a CBS TV program. The Enterprise sadly was never meant for spaceflight proper. It was the first of its kind, a proof-of-concept prototype built in 1976 to herald the future of American space exploration. It ran through a few atmospheric flights attached to other craft, performed free-flight a couple of times, and ultimately paved the way for Columbia, Challenger, Discovery, Atlantis, and Endeavour before the program was scrapped in 2011 because none of them returned from space filled with cash. Americans are achingly aware of the final fates of Challenger and Columbia. As of this writing, Atlantis is now at Kennedy Space Center (presumably in place of the shuttle replica we boarded in 2007); the Discovery is at the National Air & Space Museum in Washington, DC (delivered there nine years after our 2003 DC trip); and the Endeavor is at L.A.’s California Science Center (a bit far for us, but maybe someday). As for the Enterprise? Right here in Manhattan, floating on the Hudson River. The hard part about taking this photo was waiting for happy, impressed children and adults to stop posing with it. 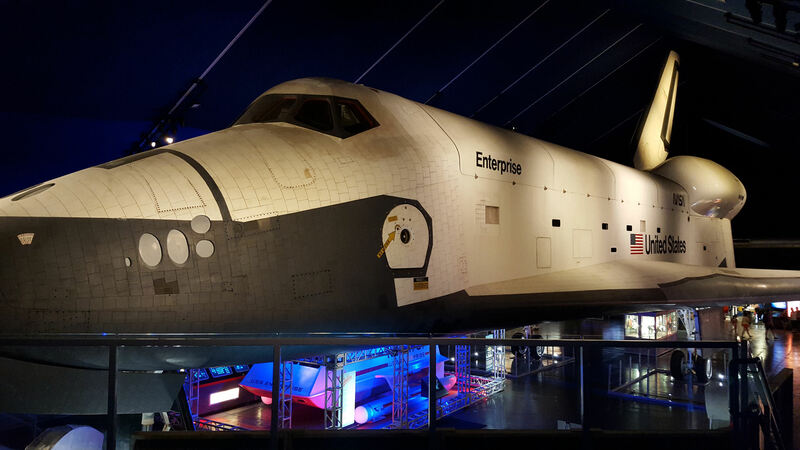 Like the space shuttle Enterprise, the starship Enterprise‘s shuttle was never fitted for true spaceflight. That would’ve made for a daunting set for filming, especially on a 1960s TV budget. Like many a TV prop from yesteryear, this one had fallen into disrepair until a group of dedicated fans teamed up and raised the funds to restore it for display purposes. Sadly, it’s still not equipped to fly in actual space. 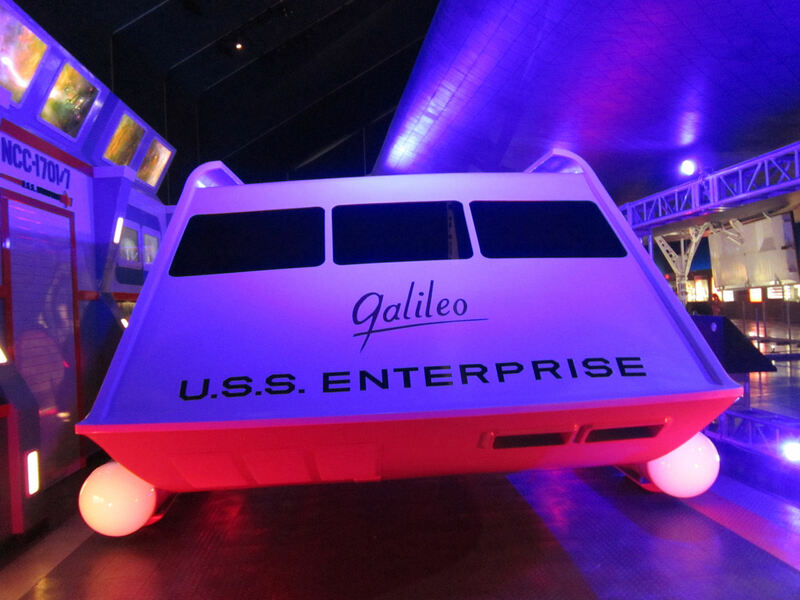 What we need are some upper-class Trek superfans to pay the SpaceX guys to refit this jalopy and do it right so we can all take turns cruising to Mars in style. A helpful monitor adds context with clips from random episodes, at least one of them containing an away-mission shuttle. 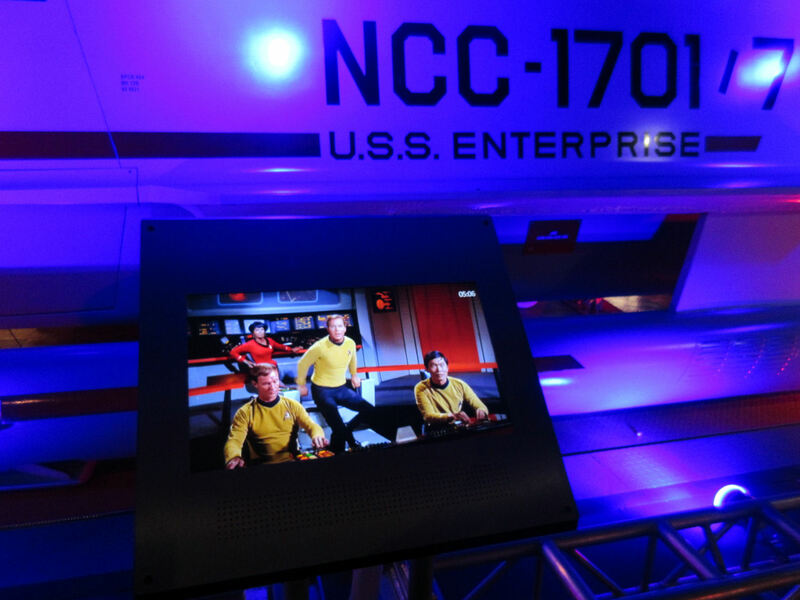 These two objects of wonder, ultimately, are why we declined the Intrepid’s other Trek-themed premium-admission exhibit, the interactive “Starfleet Academy Experience”. It sounded like an intriguing simulation, but we had a few more days of Manhattan plans ahead, not-unlimited funds at our disposal, and a more invested interest in seeing the real things shine. As “real” as fictional constructs get, I mean. Remember, the real Captain Kirk and/or Spock and/or McCoy acted aboard here. Have seen that ship a thousand times as our kids live in Manhattan but have never gone to the museum. Looks cool!! Very interesting place! 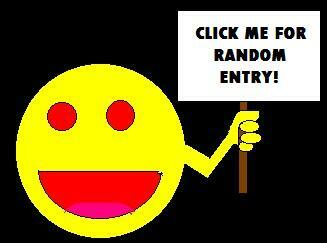 I did omit some sights just to leave surprises for anyone else who decide to drop in.